As a student at our Tempe bartending school you will learn over 150 drinks in an actual bar environment with hands on training, mixing and pouring from day one! Customer service skills, State Alcohol Awareness Certification (Responsible Bartending), are also included. Our Lifetime Job Placement Assistance, and Free Class Refreshers is unique in the education/training field. Here at Bartending Academy of Tempe, we are here to help you change your career, or help you supplement your income. Come join us, have fun, meet people, and make money. The Bartending Academy is the place to be! The minimum age to bartend in Arizona is 19. A high school diploma is not required to attend our bartending classes. Professionally trained bartenders can easily start out earning $300.00 to $800.00 per week depending on full or part time work. 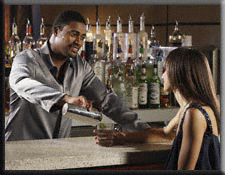 Bartending is a great way to make money and become financially independent in a short time. Attending our Tempe bartending school will give you the required education that is needed to find a great bartending job. A diploma from our school will give you the advantage to pick and choose your work environment. Our class gives you the availability to learn at your own pace in just 40 hours. Our bartending class gives you the availability to learn at your own pace in just 40 hours. We offer one to five week bartending classes taught by professional trainers that have at least 10 years on the job experience.